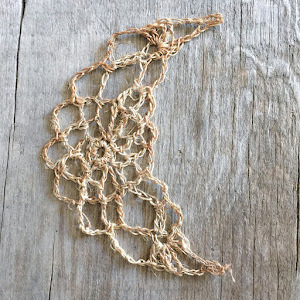 Patina Moon: It's a Crochet Thing…. I just didn't think it would take me so long. So, I found this cute coaster pattern on line that uses "jute"
Look at the back, I think even the back looks interesting! Click HERE for the link if you want to make these. I've been working on this afghan for a while now. easy to make even while watching TV. The colors remind me of the blue hydrangeas I love so much! 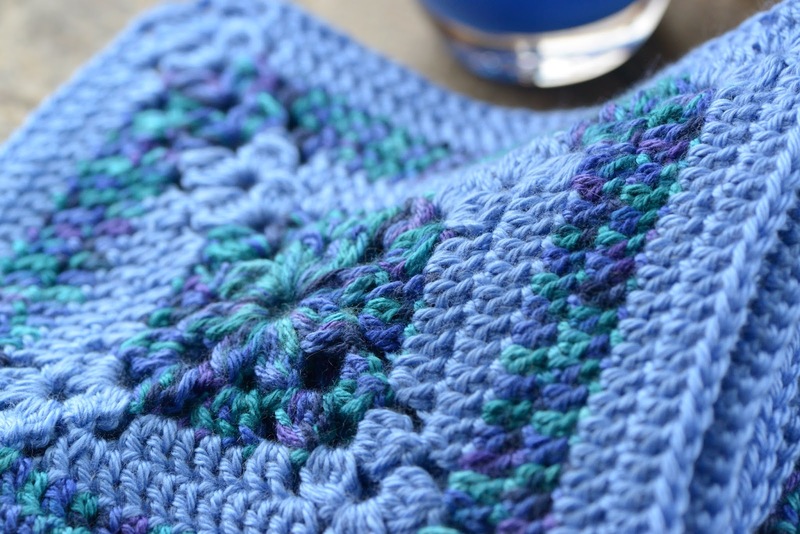 Finally, I've been going nuts about adding crocheted edgings on things. working on more of these. Don't you just love ticking fabric? Guess I'm still crazy about crochet this year! Everything is so pretty, Becca! The lacy embroidered edge on the napkins are really lovely. The little coasters really are great to use. I have a couple that a friend made me years ago that I still use. 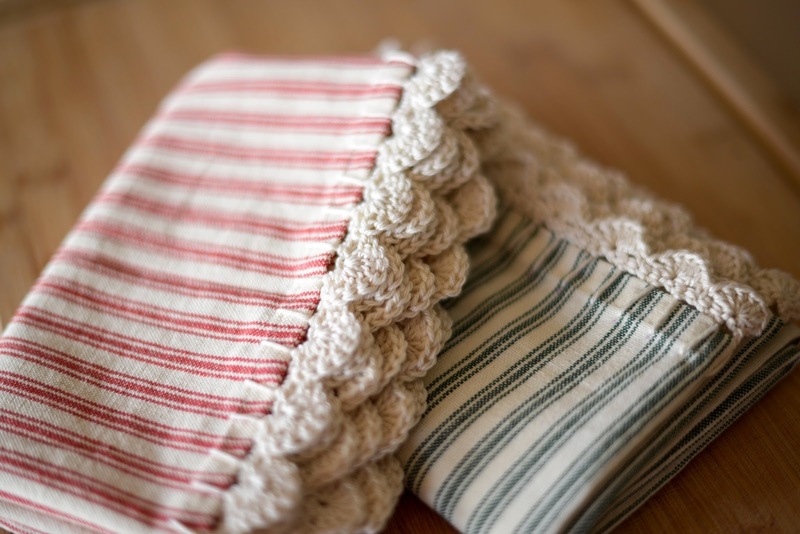 And I love the crochet edging you're doing...would look great on anything. The ticking is fun! Enjoy your week my friend! And thanks for the link...I'm off to see if I can make a coaster! So many pretties my friend. I just love the way your coasters turned out. Can't wait to see your Afghan when its all done. The tea towels are amazing and the coasters...A-dorable! You sure got it going on when it comes to the needle and your yarn. Wonderful creations! I am up to my ears in painting and I want to bind more journals/sketchbooks this year but so far only have the boards and spines cut and I want this to be the year of using what I already have...use up those supplies once and for all. love those edgings and of course the ticking too. 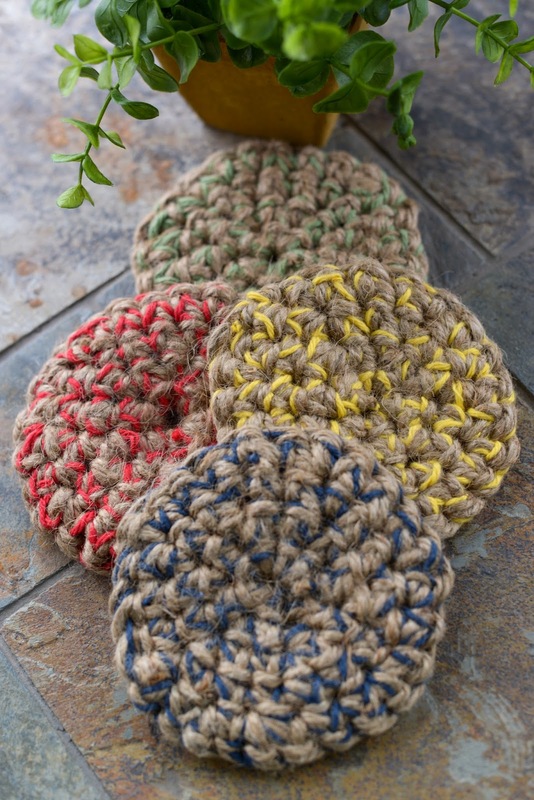 the coasters are great-i bet the jute makes a great coaster fiber! 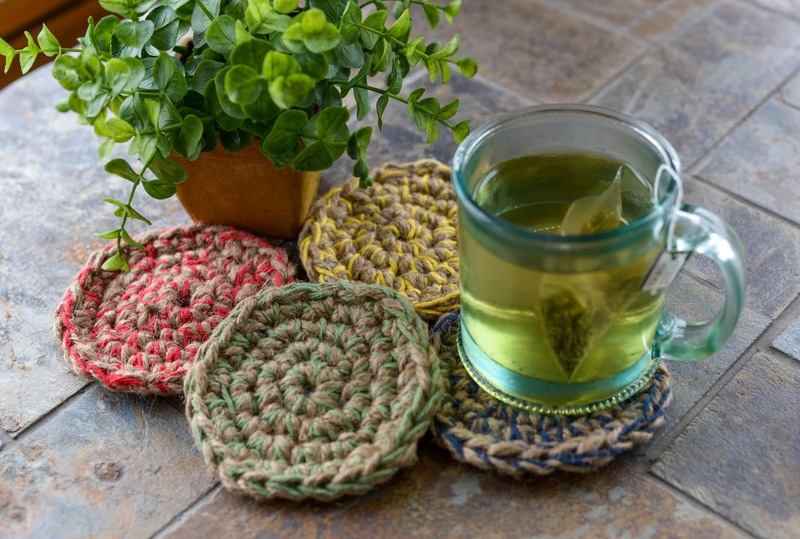 Those coaster are wonderful, Becca, but I'm wondering how tough it was to work with the jute. I just love the colors you chose for your afghan. Gorgeous blues! You are such a crafty girl my friend! So many lovely things you made. I like the colors of your afghan. Very pretty. Love that yarn and jute combo! And those tea towels are beautiful! I'm a little jealous of their recipient!! Can't wait to see your afghan finished! I too am working on an afghan! That blue is stunning, Becca! It's going to be a beautiful afghan! Love the cute coasters and the edging, too! You are amazing, Becca, and these coaster look fantastic! 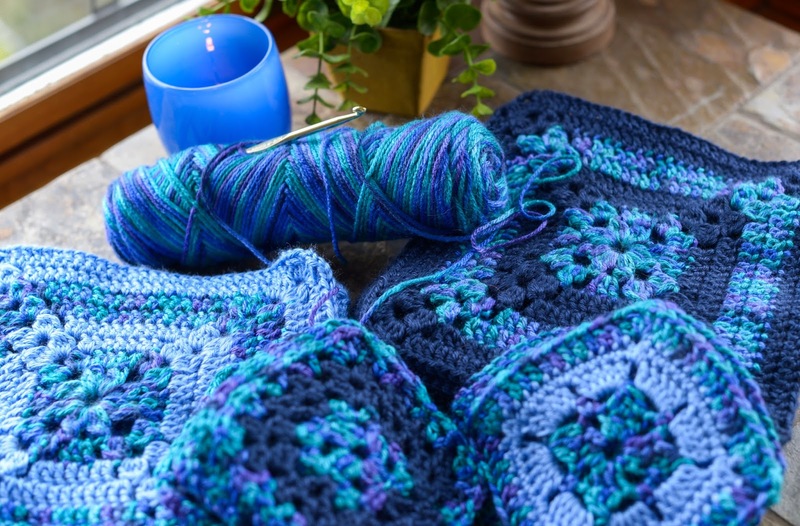 It's always so interesting to see what you're up to, and seeing your wonderful projects makes me want to pick up crochet, too! That's going to be a very pretty afghan, Becca! We are back home and the decorations are finally put away. It feels good to be back online as we just picked up our computer yesterday. Happy New Year! they are just perfect! and they arrived at my home with the beautiful scent of lavender. i can never thank you enough.